Are you new to the world of Cashmere? Find out more about one of the most luxurious and sought after natural fibres with our 5 fun facts. The fibres in Cashmere is very similar to sheep wool, however it’s lack of lanolin makes it hypoallergenic. This is why Cashmere makes a great material for young children and babies, due to its protective quality. Cashmere fibres are so tiny that the diameter of one strand of yarn is about 1/10 the diameter of human hair. This means it takes a lot more to produce one Cashmere product. For example, producing one women’s scarf takes approximately 2-3 goats worth of wool. 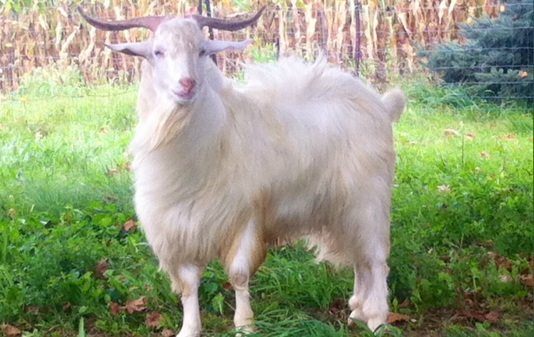 Male goats are more desired because they are able to produce larger quantities of wool. It is estimated that a goat is able to produce around 100 grams of usable fibre every year. Clothes made from Cashmere sustain keep their original shape and do not stretch or fade, given they are taken care of properly, ofcourse! Cashmere comes in three colours naturally: gray, brown and white. However, these can be dyed into any colour. At Feine Cashmere, we have an extensive range of colour choices for the colourful mind! Looking for a new Winter jumper staple? We've got you covered! Shop for her here and see our latest jumper/pullover styles for a stylish new look. Cashmere is a delicate, luxury product and requires careful care and maintenance to ensure its softness. Read our step-by-step guide to washing cashmere and wool. Cashmere is a fine natural fabric that is sought after for its exceptionally soft touch and beautiful appearance, here are 5 Cashmere care tips that you need to know. While we are hard at work planning and creating cashmere pieces, we do like to allow a little time away for R&R. Here are the 5 destinations we can’t seem to get out of our minds. We have always loved cashmere ponchos and capes! Here is some new inspiration for incorporating these cozy items into your wardrobe today. Just click read more below. Father’s Day is next weekend and if you’re still looking for the perfect gift, read more for 4 great options for dad. We adore browsing fashion trends on Instagram and posting our lovely images. Click 'Read more' below for the full list of the Instagram accounts we #LovetoFollow. Great music can (and has!) inspired great fashion. We love a few good tunes playing while we work. Here are a few of the songs we are listening to now. Read more for the full list!